The Metal Hero series is the notorious “third wheel” of Toei’s Henshin Hero franchises, which that ran from 1982 to 1999 alongside Super Sentai and at times Kamen Rider. 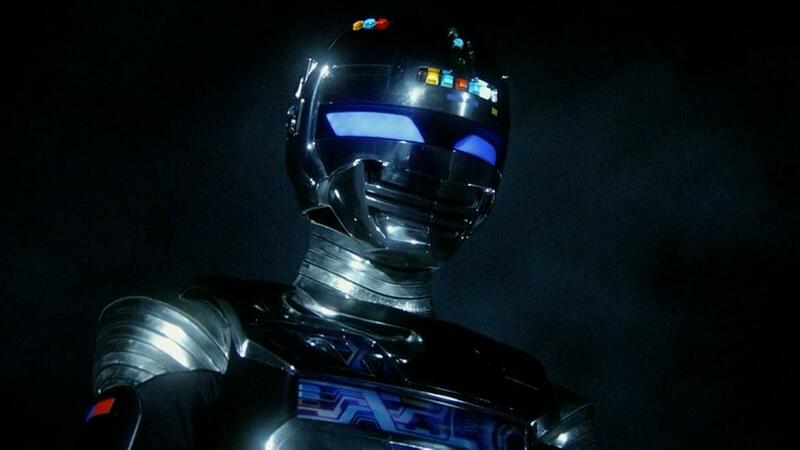 The franchise started with the Space Sheriff trilogy of shows, Gavan, Sharivan, and Shaider, the first of which is perhaps the most famous Metal Hero to this day. To celebrate Gavan’s 30th anniversary, Toei put together Space Sheriff Gavan: The Movie which would see a new hero in the iconic armor on a new adventure for the 21st century. Sadly, the resulting film wasn’t the grand celebration it should have been. The film centers on a group of three childhood friends, the hotheaded Geki Jumonji, the cold Toya Okuma, and nice girl Itsuki Kawai. I wish there was more to say about their personalities, especially Itsuki’s, but there isn’t. Geki, the new Gavan, fits the Hero template to a T and there’s not much to him besides that, while Itsuki is the kind girl with “future damsel in distress” writ large above her head. Within the first five minutes you understand where the plot is going to go, and while that isn’t necessarily a bad thing, in this case there isn’t enough meat on the film’s bones. Geki and Toya disappear when the space shuttle they were flying encounters a wormhole. Geki is rescued by the original Gavan, but Toya gets sucked in and is presumed dead. Geki signs up with the Space Sheriffs to become the new Gavan, and has to return to Earth when the Maku crime syndicate attacks the place he, Toya, and Itsuki used to work. The syndicate is now led by new villain Brighton, who for some “mysterious” reason is looking into things related to Toya’s old wormhole research. This film has a very interesting problem that I haven’t seen very often, that I think I’ll attribute to bad direction. Multiple times as I was watching I noticed the actors would pause, ostensibly for dramatic effect, and almost stop acting. There would be an unnatural pause before their lines where I guess a reaction shot could go, but the problem is they wouldn’t react. They would just stare for a second, and I have a theory that they were waiting for the director to cue their lines. It’s especially notable because it wasn’t just one actor, so I can’t attribute it to them being inexperienced or anything like that. It’s inherent to the entire production. Normally this is something that would disappear in post, but it was left in, so I have to wonder if it’s intentional and the director wanted reaction shots but forgot to tell his actors. It can be considered a small issue, but it’s indicative of the larger awkwardness of the entire film. The fight scenes have a similar problem in that there’s quite a bit of direction missing from them. They’re less fights and more obligatory special move moments. The final fight especially is reminiscent of a stage production moreso than a film’s set piece. We see the two combatants mostly in wide angle, swinging their swords and tucking them under their armpits when they get hit. There’s no clever editing or choreography to “trick” the audience into buying the fight. Everything is laid bare, as is, for you to do what you will with it. The entire film almost feels like the director read off of a checklist of things the studio expected of him. “Action scenes, check. Call back to original series, check. Main characters know each other, check.” The end result is a pretty heartless affair. Kenji Ohba, the original Gavan, elevates the film quite a bit when he’s on screen, and Geki’s actor gives a better performance when the two get to play off each other. This implies that the right pieces were there, but the final glue to assemble a really good film was missing. Geki and the original Gavan were the only things I liked about the film. Geki’s friends were utterly useless. The V Cinema Sharivan and Shaider movies were much better.